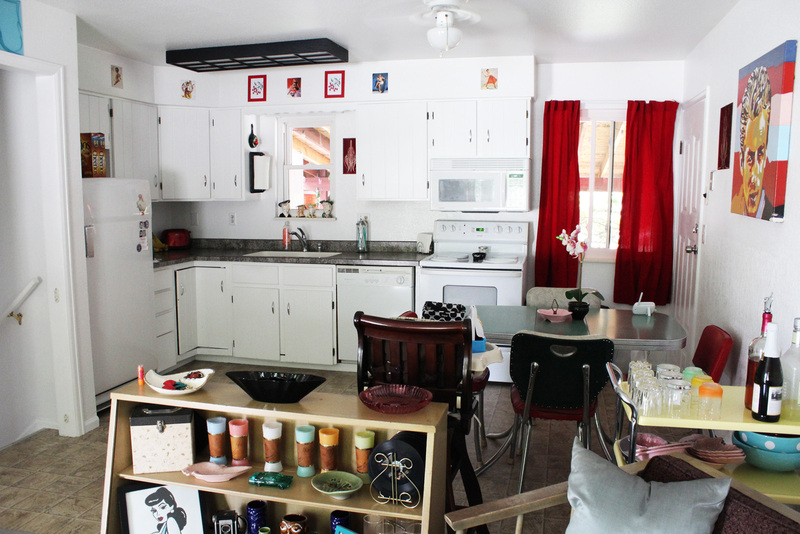 I have always wanted to do a post of our home because I love our house so much! 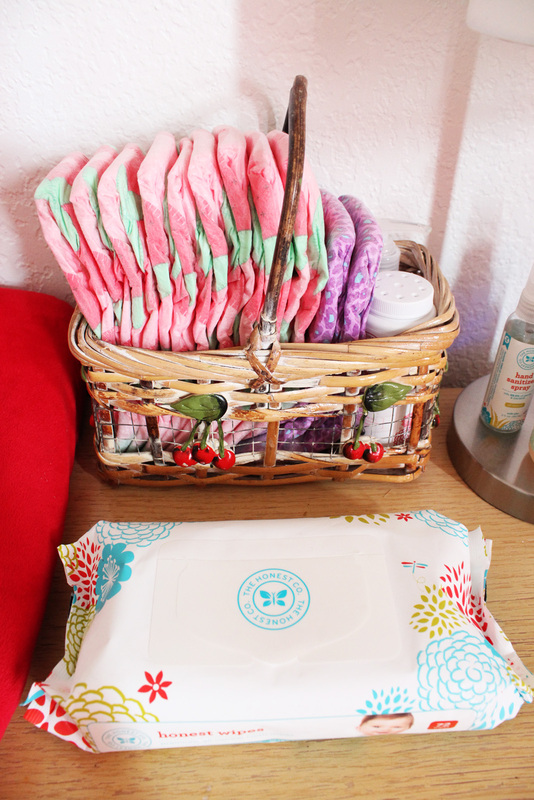 We take pride in where we live and want to make it look its best at all times. 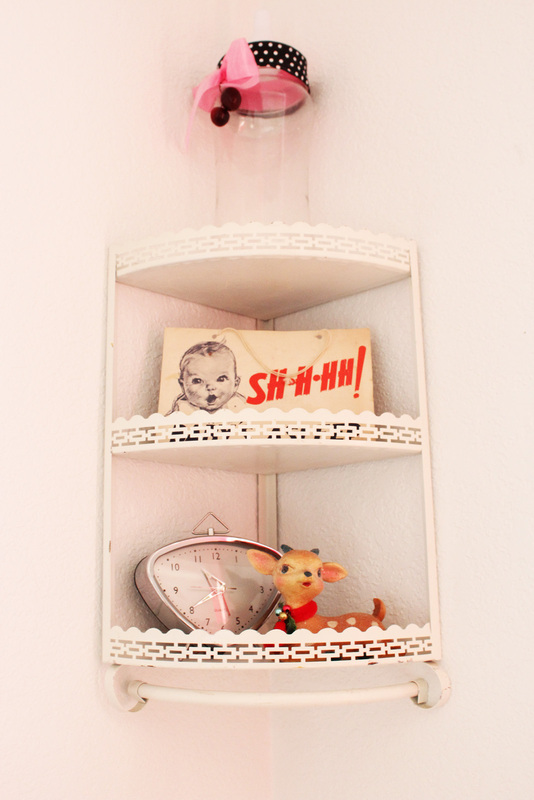 Our goal is to have a vintage livable, (now baby proof) home. We mostly have vintage furniture in our house that was all found and purchased by us or it was given to us. 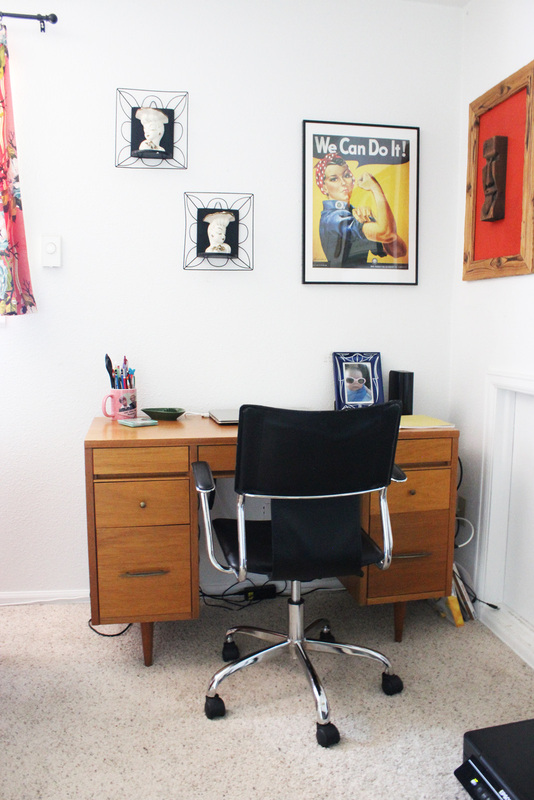 We try to find the most affordable pieces as possible! 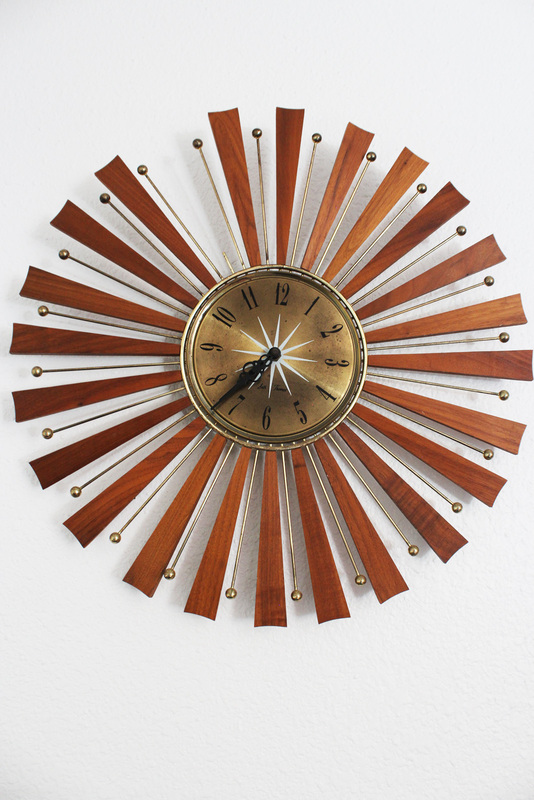 Who doesn’t like to get vintage pieces at a great price, right? I would say our house is still a work in progress, I would like to do some painting as my next project. I will post about that once it is finished. This is our home as it is currently. I took a few photos of each room to show the decor. I will also post a video soon after. I hope you enjoy looking at our vintage home! 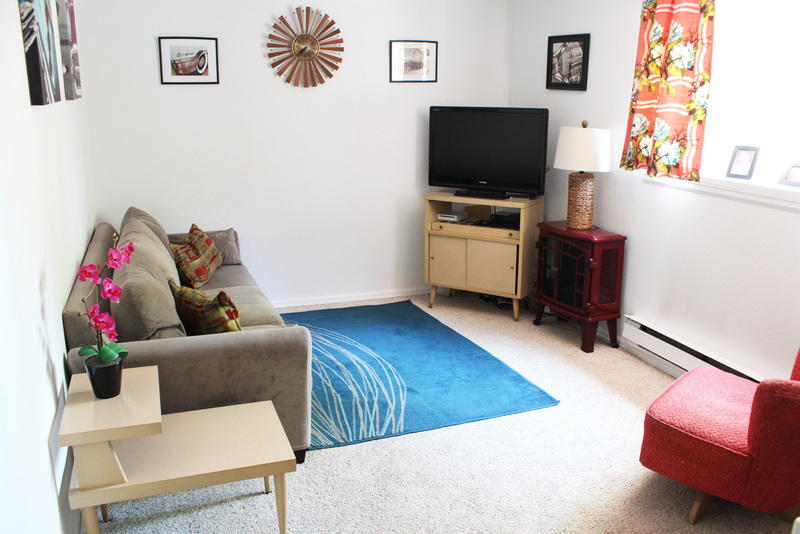 This is our living room upstairs, we mostly use this when we have guests over. Furniture: Vintage sofa, vintage two tiered end table, vintage coffee table, vintage chair, vintage 1923 Victrola record player (was my grandparents), vintage display case, vintage barkcloth hawaiian print curtains. All other pieces were found here and there at estate sales, garage sales, antique mall and everyday stores like TJ Maxx, Target and Ikea. Our vintage display case was picked up at a local swap meet for $20.00, it could use a refinish but I like the character it has. 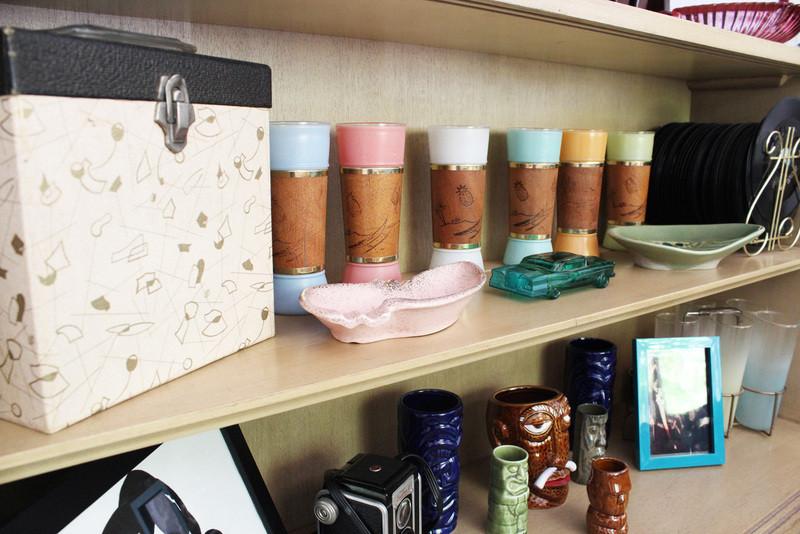 I like to keep some of my vintage finds here, including my Siestaware Tiki Glasses, ashtrays, some of our 45’s and vintage cameras. This is the view of the kitchen from the living room. It is very simple and clean which I like. 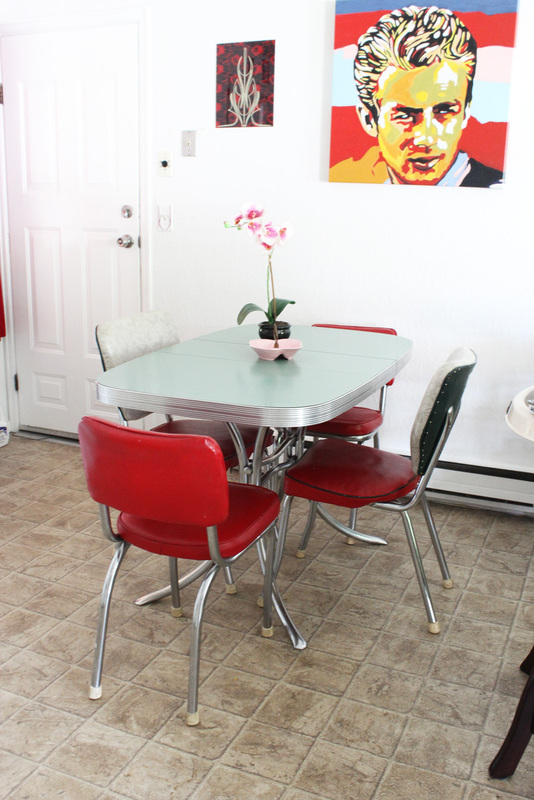 I plan on possibly painting this a shade of green to match the formica on my table. Here are two of my favorite pieces in the kitchen because they are very unique! 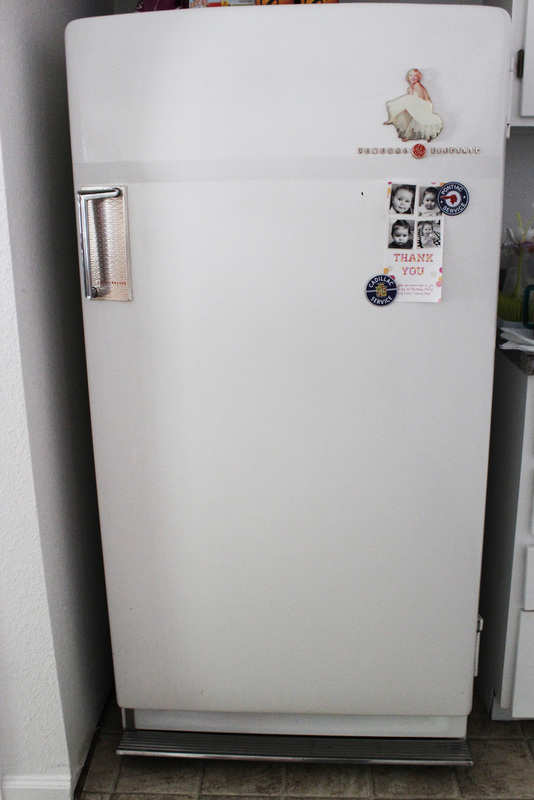 The vintage refrigerator was purchased at an estate sale and the inside is aqua with bronze shelves, and it has a pedal on the bottom to open the door by just stepping on the lever. 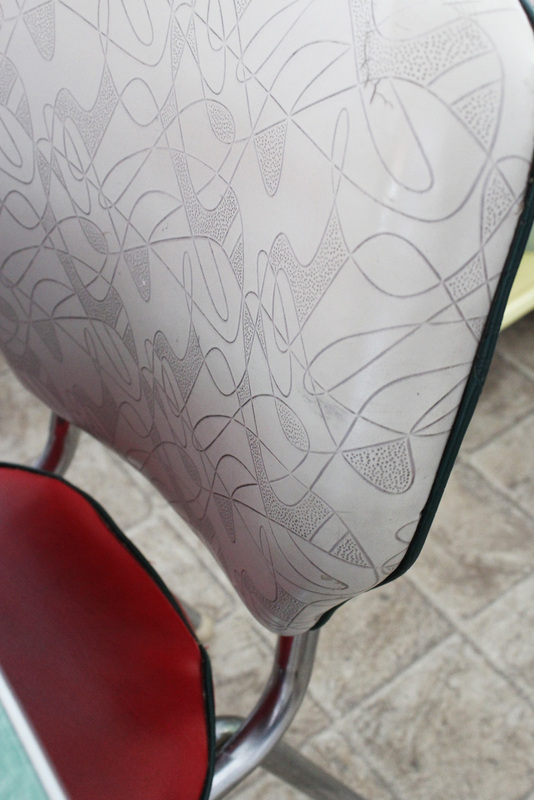 The dining chairs have an atomic print back that was original when purchased. This is our living area downstairs that we use on a daily basis. 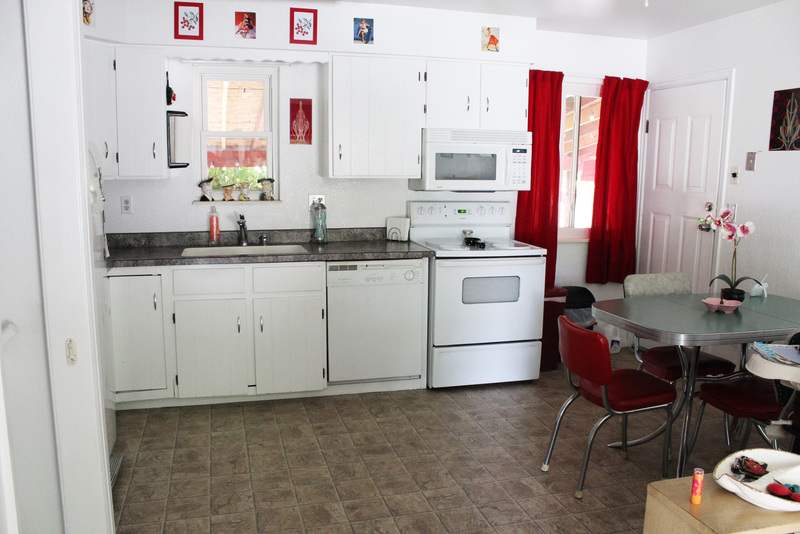 All of the furniture except the couch and stove is vintage. We wanted this to be a bit more comfortable since we are down here everyday. 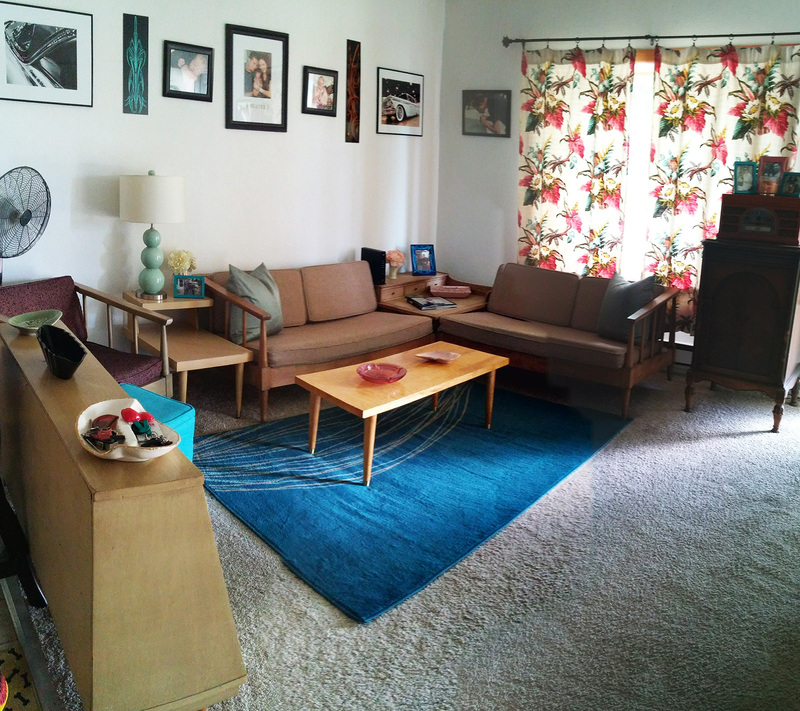 Furniture: Couch from World Market, Vintage end table, Vintage slipper chair, Vintage bar that we use as a TV stand, Vintage atomic clock. This is my office area that is combined with our living room downstairs. 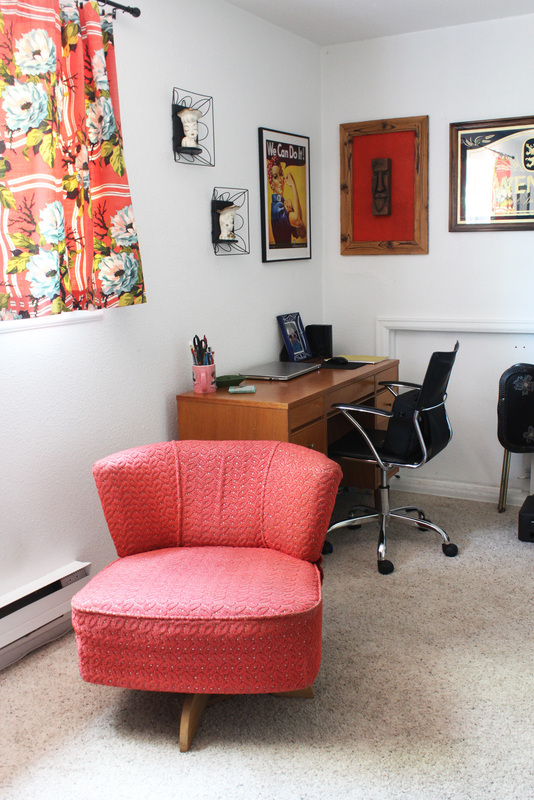 Furniture: Vintage coral slipper chair, Vintage desk, Vintage lady head vase wall plaques, Vintage barkcloth curtains. 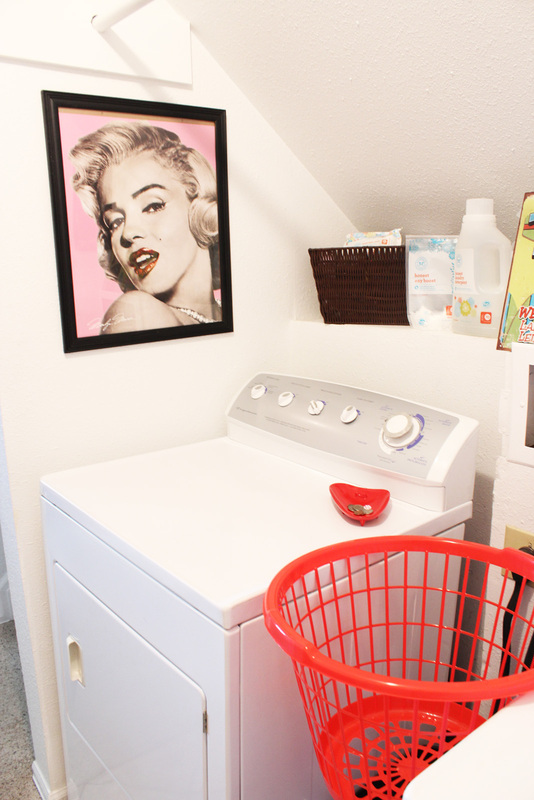 Our laundry room is pretty simple and I plan to give this area a revamp real soon! I have hung my Marilyn Monroe and James Dean pictures here. Stay tuned for the before and after. 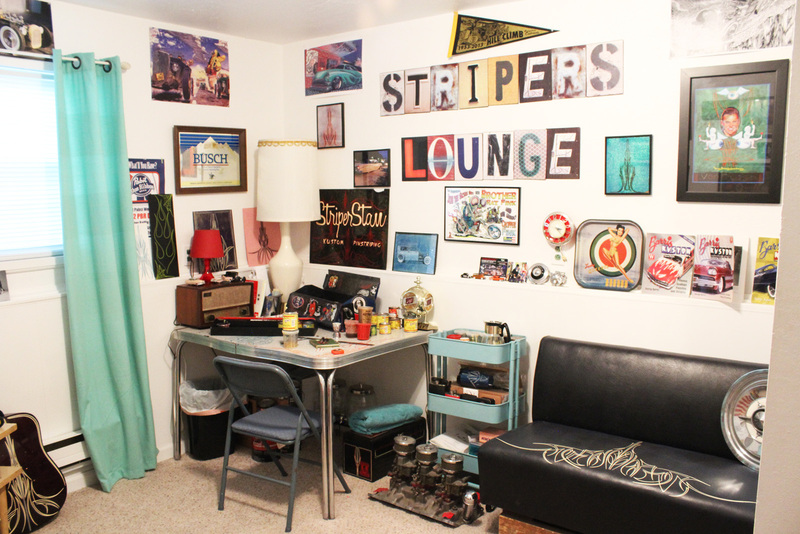 This is the Stripers Lounge, where Stan does all of his pinstriping. 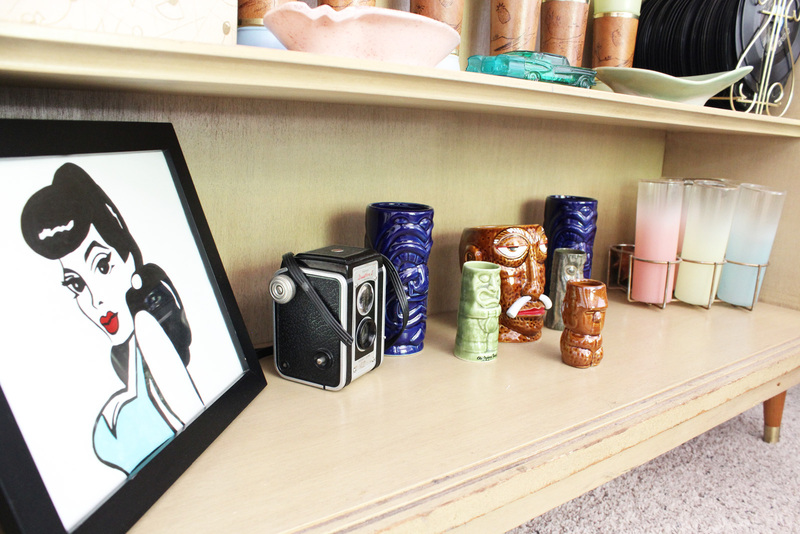 He also keeps some of his collectibles up around the room along with artwork we have started to collect, specifically Keith Weesner. I have taken a few photos of the room and some of the small details. Here is the opposing wall to the first photo. This is the Weesner wall. I have started getting him a new one for his birthday every year to start his collection. 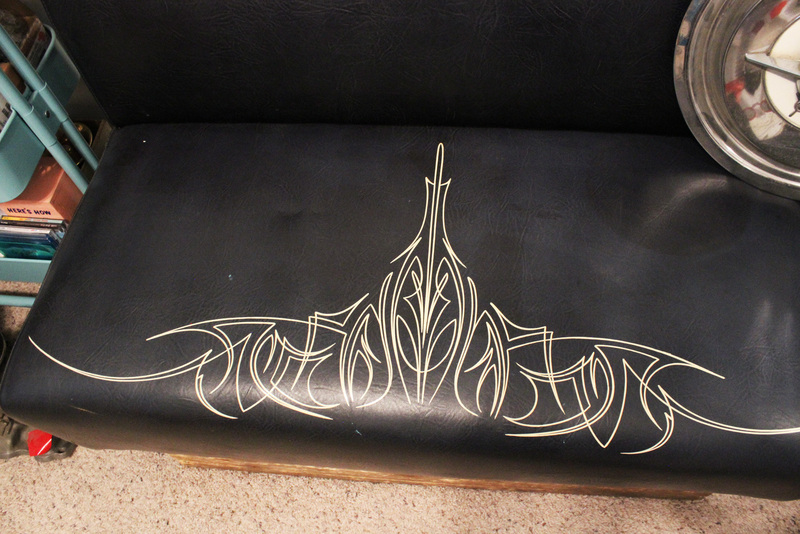 If you are interested in Keith Weesner you can see his work here. 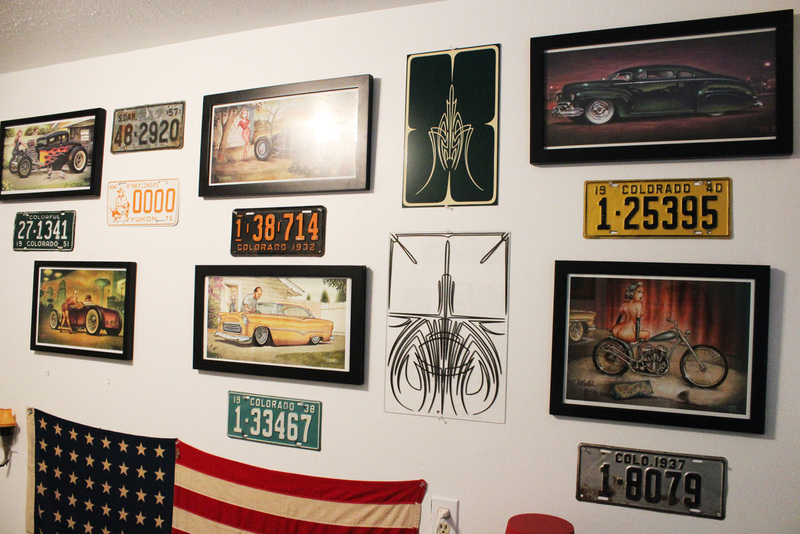 These are mixed in with some vintage Colorado license plates from the 30’s and 40’s and pinstriped panels. 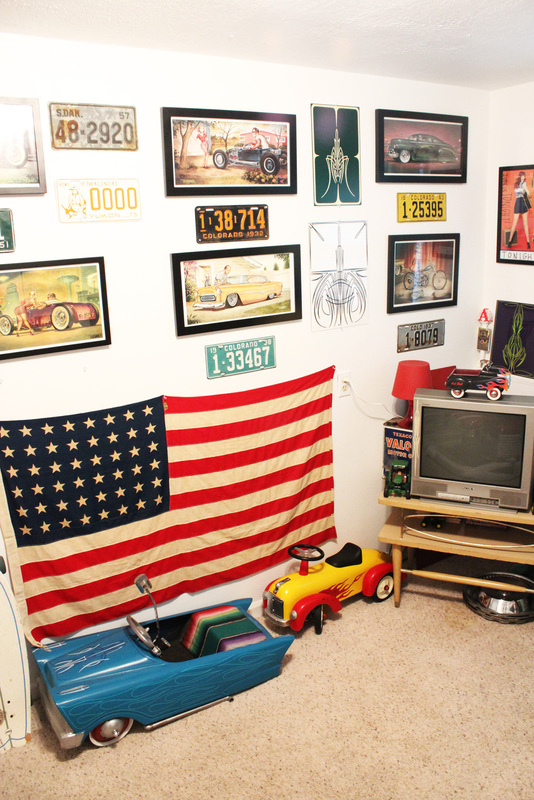 The two small cars are Cherry’s, the turquoise kustom pedal car and the yellow and red hot rod. She sure loves them! 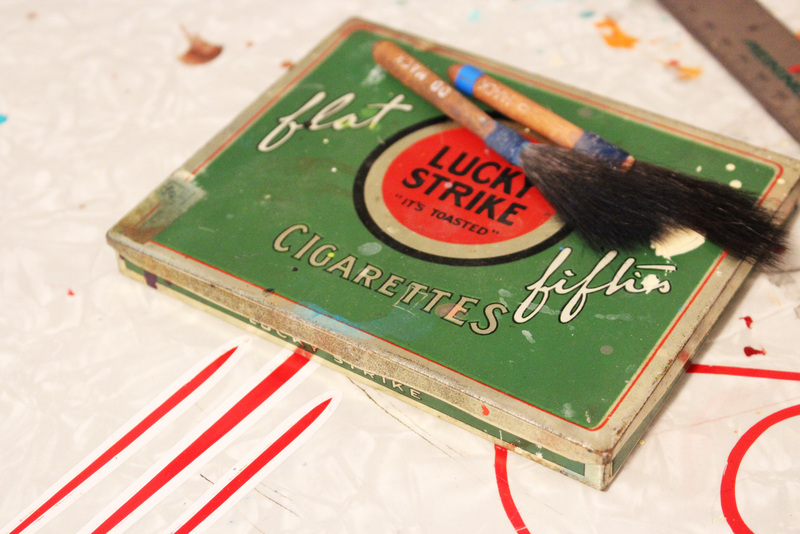 I got this vintage Lucky Strike case for Stan years ago and he uses it for his pinstriping brushes. Nifty idea! 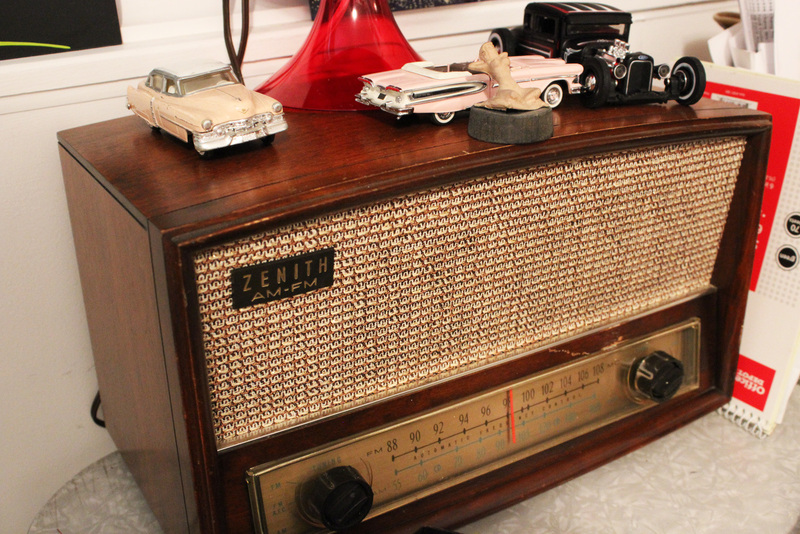 We collect old vintage radios, most are in the closet because we have no room to display them currently, but here is one that is in working condition that we listen to when hanging out in the lounge. 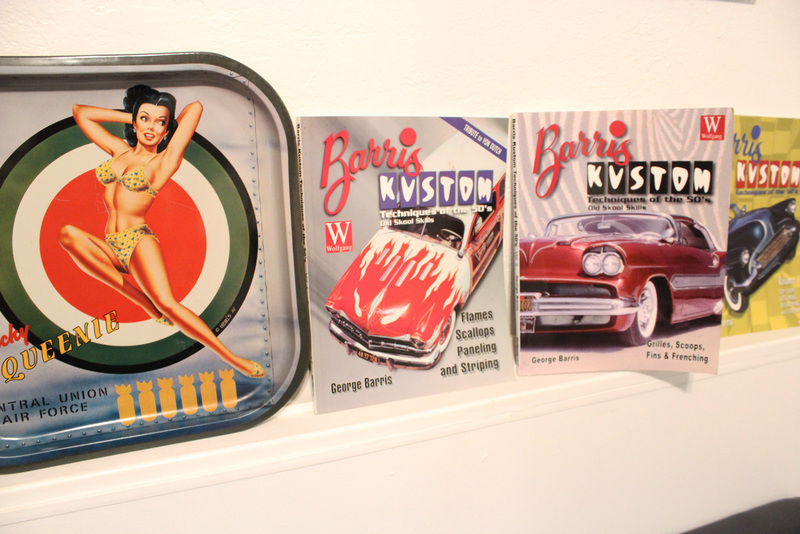 Here is some of Stan’s George Barris books that he collects and a pinup girl tray that I found at a swap meet, naturally it made it’s way to the stripers lounge. 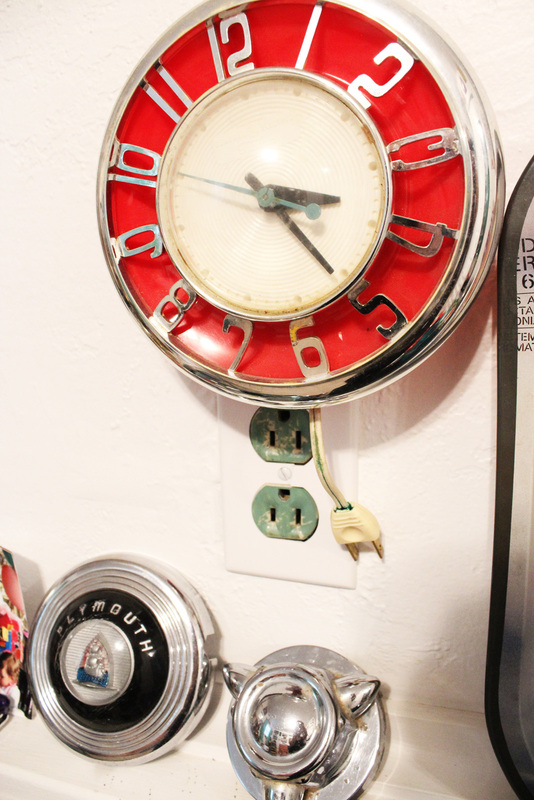 This vintage clock that he found at a swap meet is one of the most unique items in the room! I unplugged it though because it is super loud when it is running. For some reason, we have quite the collection of acoustic guitars that Stan just pinstripes and we have on display, too bad neither of us can play them. Next is the black and white bathroom next to the Stripers Lounge. I have taken photos out of books of Marilyn Monroe, Elvis, James Dean, and some of the Barris books and created a nice little wall of black and whites. 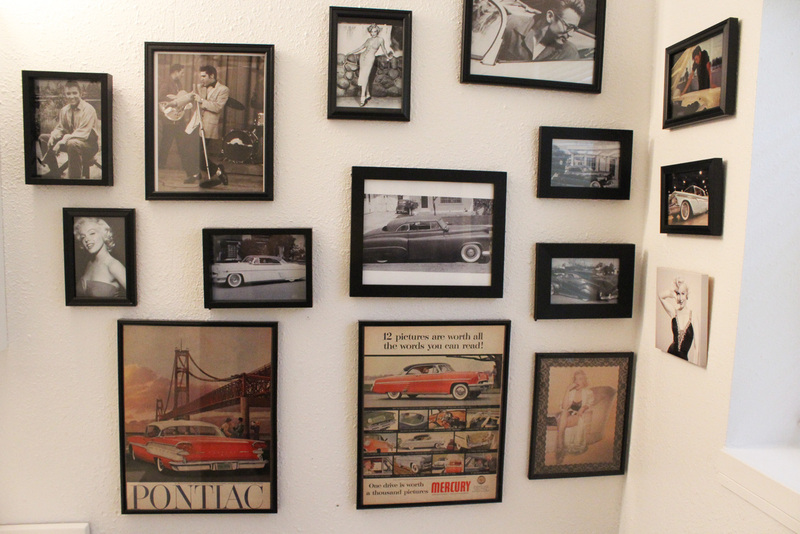 Mixed in are some vintage car ads that I picked up at swap meets and estate sales. 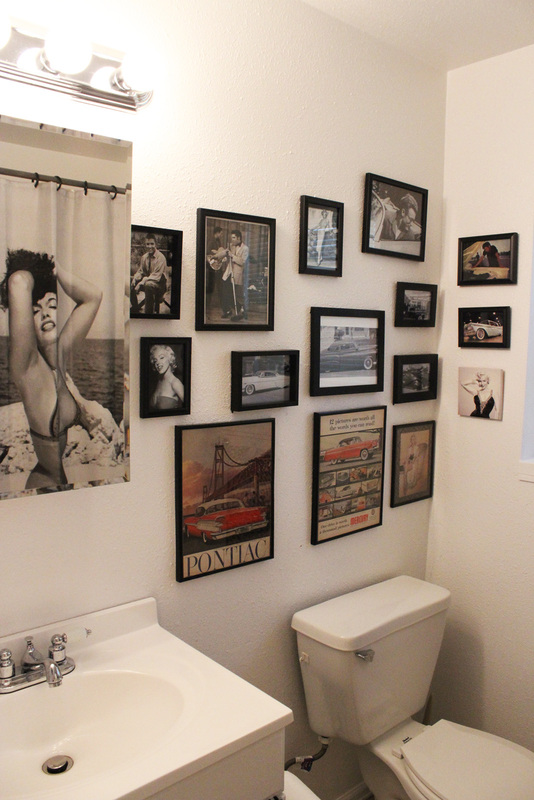 Since it is our guest bath, we decided to keep it to a car and pin up theme. This is a very fitting Bettie Page shower curtain that I picked up from Modcloth. 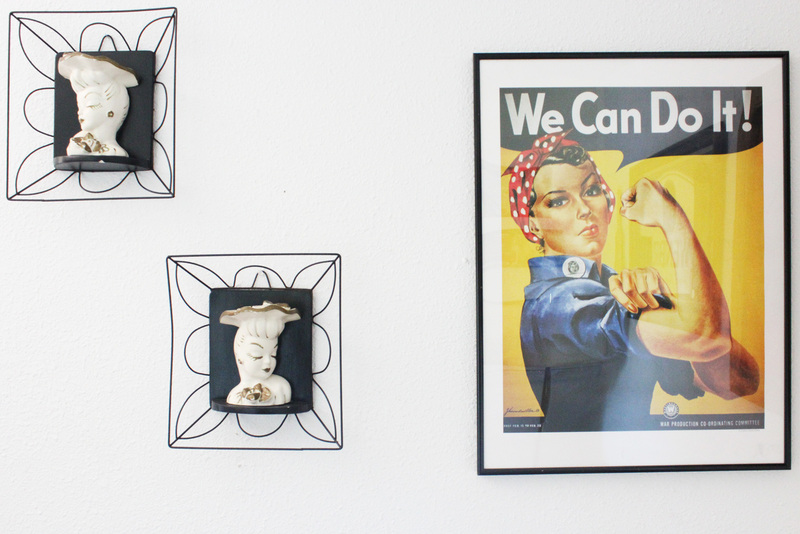 The magazine rack is a vintage hairpin leg metal rack purchased at an antique mall. 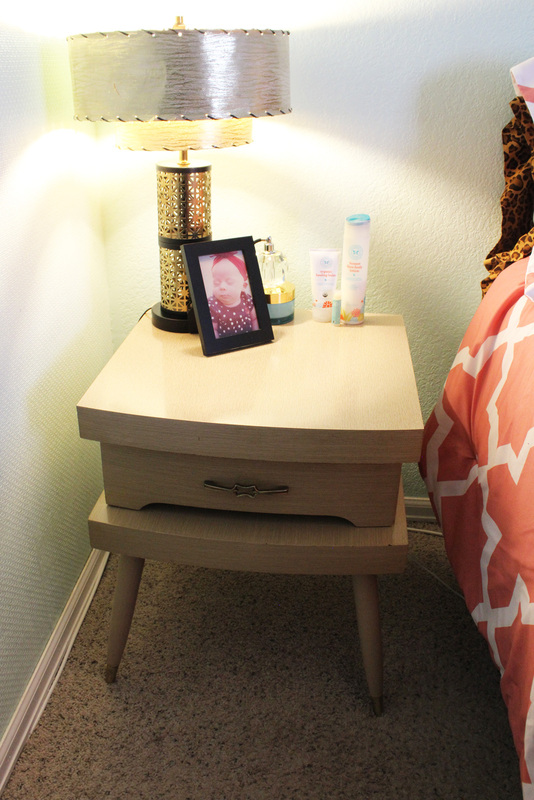 Our bedroom is a great mixture of vintage and modern pieces, the matching end tables and two tier lamps are vintage. They were both purchased the same day off of craigslist, what luck! 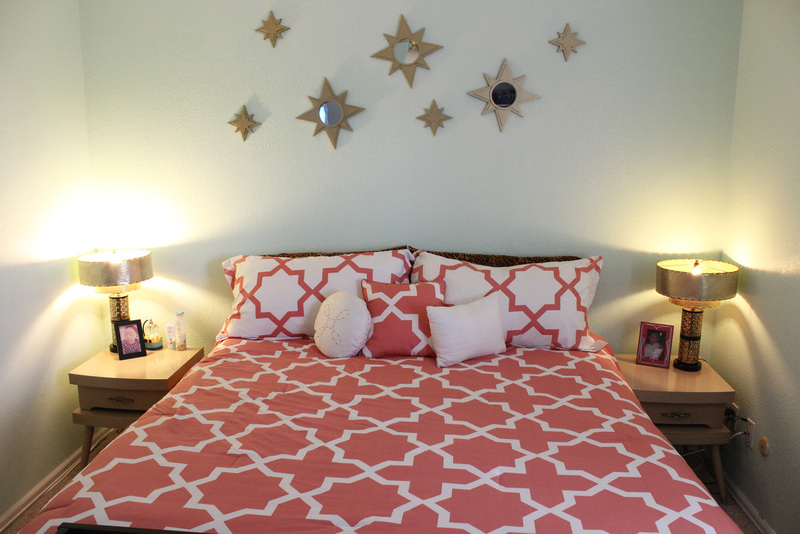 The bedding and mirrors are modern, but they match the room beautifully. 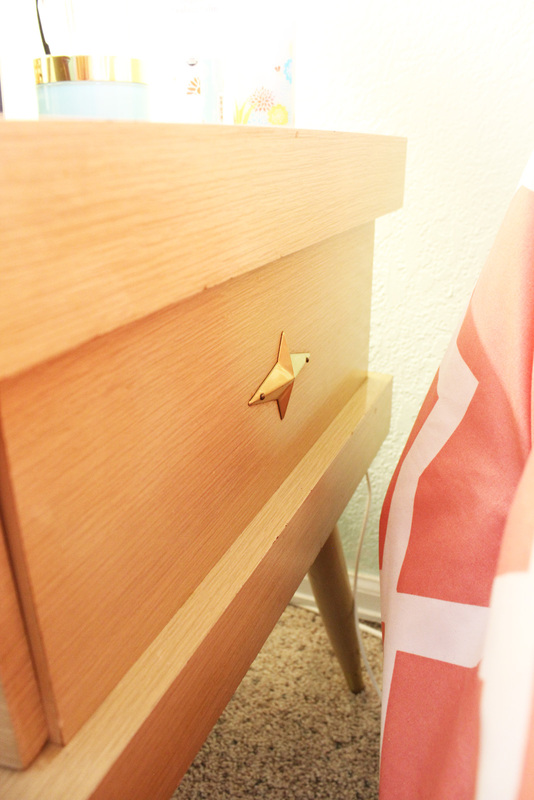 A few other details in the room, the end tables have this very cool atomic star on the sides that I wish could be on display but our room isn’t wide enough. 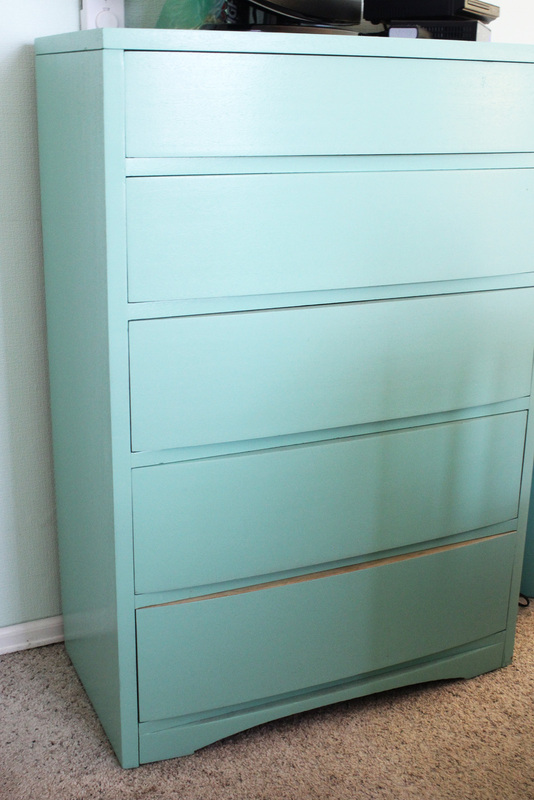 The mint green dresser was given to us and Stan and I refinished and then it was painted with the leftover color from our Edsel Lucy (Fun Fact)! 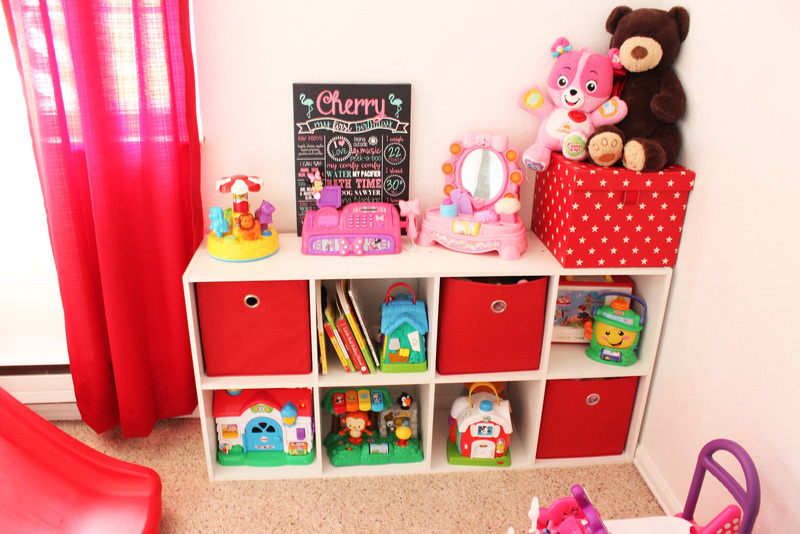 Here is Cherry’s room! The cutest room in the house. 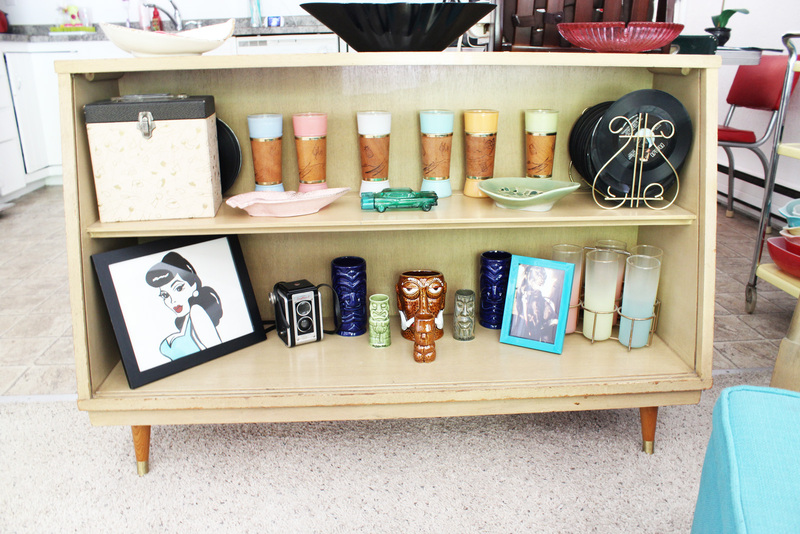 She has some vintage pieces in the room as well as modern and handmade. 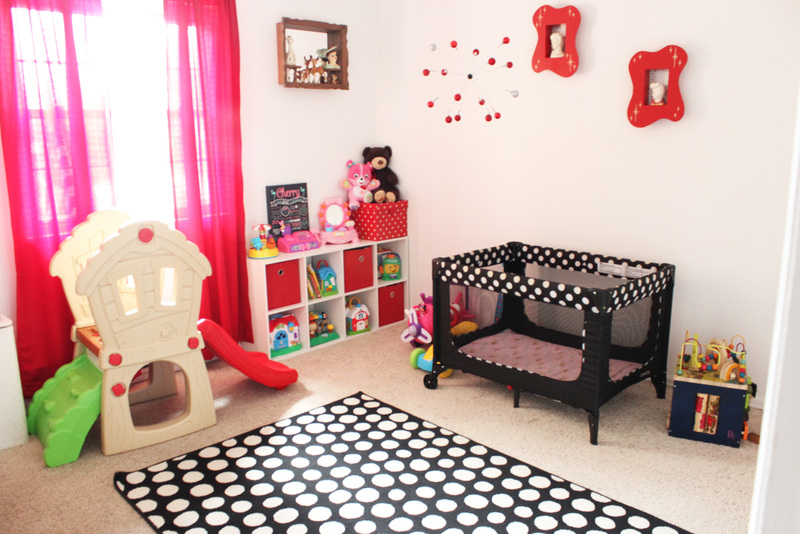 The cube storage is from Target, the polka dot rug is from Ikea, the shadow boxes were made by my dad, the atomic mobile was made by me, and the brown shadow box is vintage. 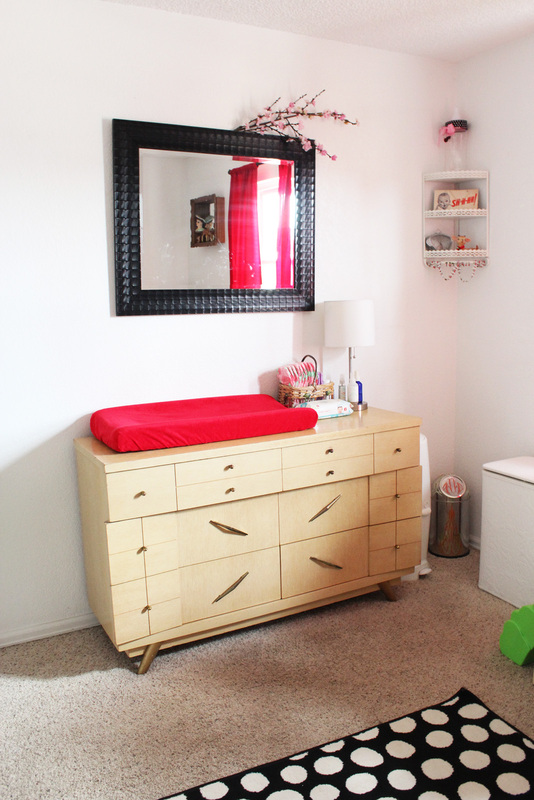 We used a vintage dresser as her changing table and dresser. 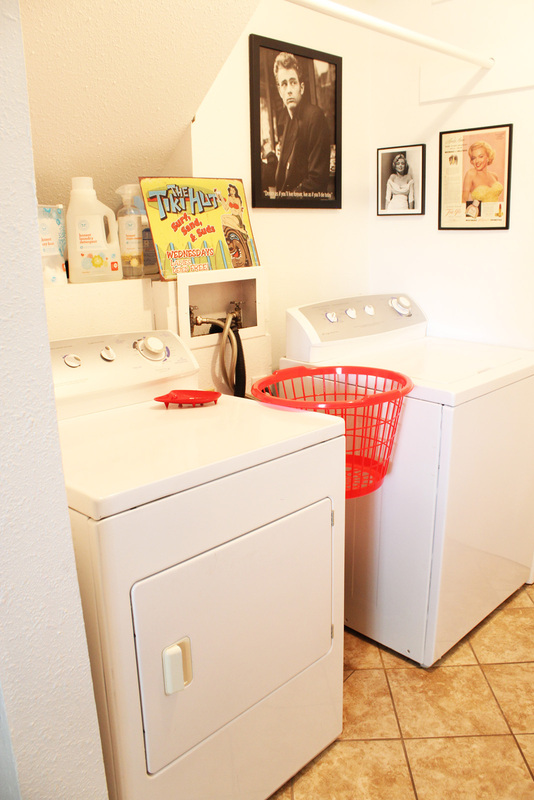 The hamper and metal corner shelf are vintage and purchased at estate sales. 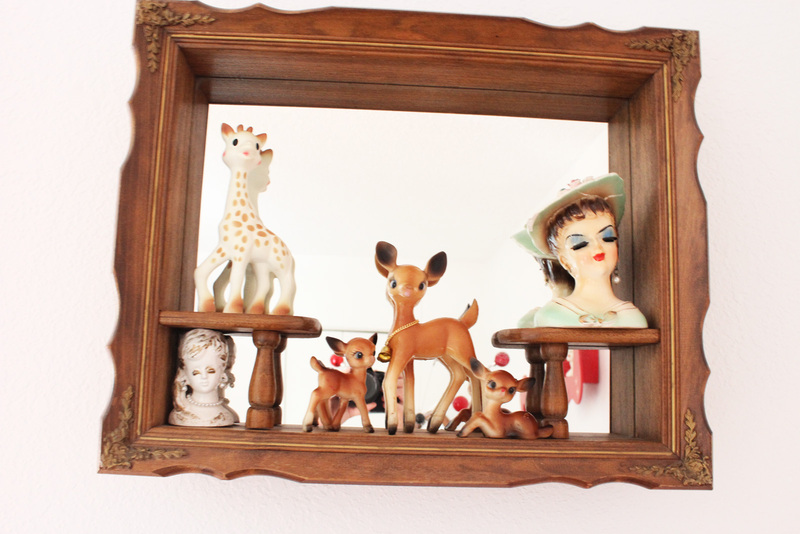 The vintage doe collection is something I began last Christmas and plan on continuing every year. I wanted Cherry to have something vintage she likes to collect similar to my lady head vases and Stan’s hubcap collection. Here is Stan’s shop, Striper Stan Kustoms. I hope you enjoyed taking a tour of our vintage home!!!! 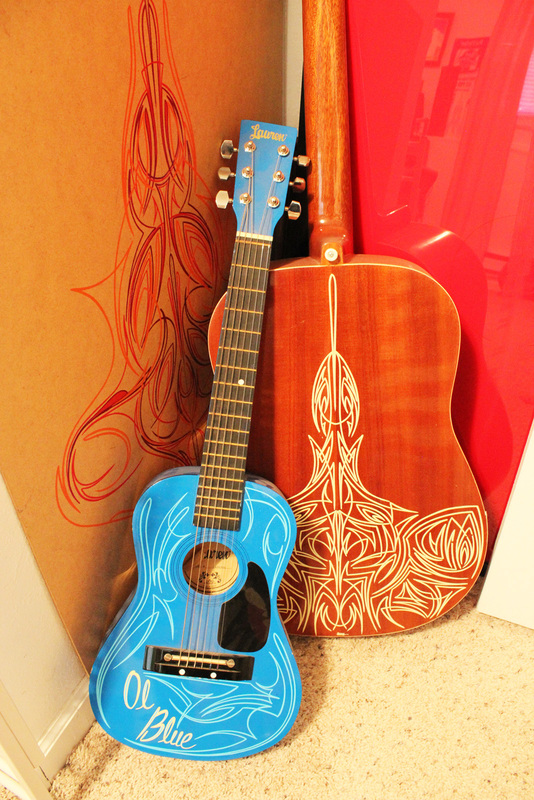 Your house is full of irreplaceable treasures! Thanks for the invite to see all the timeless pieces they all come together so uniquely! Hat’s off to the two of you, your home reflects all of your personalitys, talent and love for the vintage era! Beautiful home!